My sister Ruth is back to do a little bit more of the heavy lifting around here. Last week I showed off her first cabinet door bench…and guess what, she made TWO. I know, I am humbled by her ability and get-up-and-go too! And, to make us all feel even worse about ourselves, she has 4 kids, works part-time and is pregnant! How does she do it? I honestly don’t know. Before we get to the project, I thought I’d share a little about my siblings–who really are my best friends. We recently were all together, which is rare. Although there are kids sort of scattered around in this picture, we are all standing in order, oldest to youngest, right to left. That’s my oldest sister, Ruth, on the far right. She will be sharing the project with you today. She is holding her youngest, Rose. Then, I am next to Ruth, and am holding my baby, Bernadette. Next is Maria, holding her baby, Patrick (all three of us had babies in 2012). Dressed all in blue is my youngest sister, Susan. She is a member of the Community of the Lamb (a nun) and lives in France, which is why we are rarely all together. I love love love my siblings! This bench is similar to Ruth’s other bench in that it uses lots of materials found at her local re-use store. In fact, the actual building process is very similar. Please, follow that tutorial, but not the following differences. First of all, Ruth angled the top of the back legs, so that the back rest of this bench is slightly tilted back. Also, she used one big cabinet door to make the backrest. 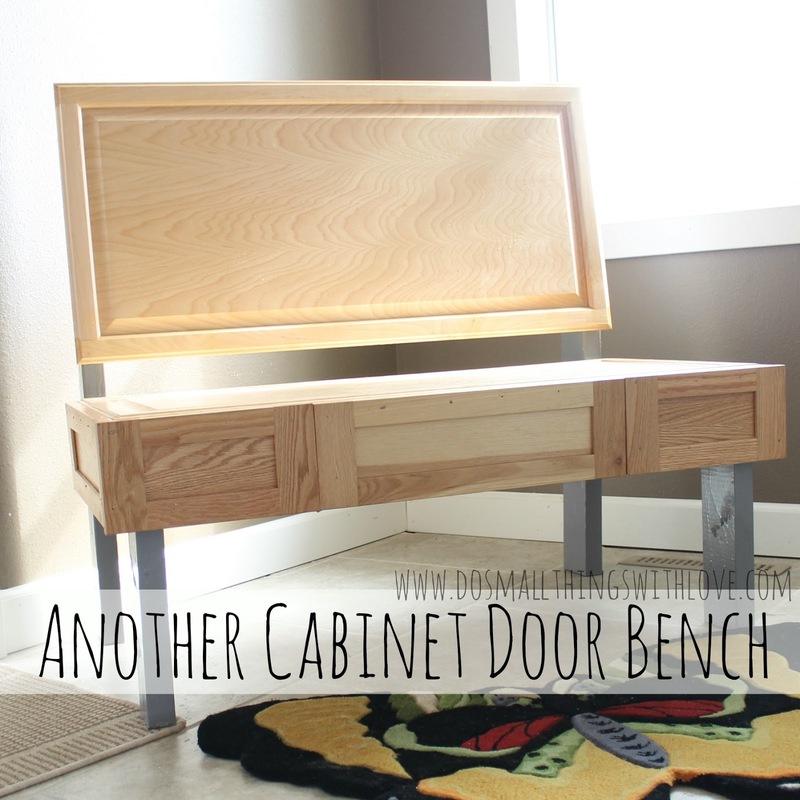 Next, instead of using flooring to cover the seat of the bench, she used another cabinet door. And, instead of using door trim for the edging of the seat, she used drawer faces. And finally, Ruth painted the legs of this bench a grey, which I really like. It gives the legs a “metallic” look. And there you have it! bench #2. I have a pretty remarkable sister. I’d love to her your thoughts here. Which of Ruth’s 2 benches do you like best? What a special time when the family can all be together. As you get older, that seems to become more difficult. Your sister’s bench is a cool idea. She is very clever. This bench is so pretty! I’m visiting you today from Salt Tree. I’m co-hosting a Linky Party today and would LOVE for you to add this. I hope you get a chance to stop by my blog, leave a comment and Link Up, too! This is awesome. Your sister is very talented! I love the picture of your family, and I’m so curious about your sister being a nun in France– that sounds so special.